Remember where you saw it first! This is truly a unique product and the first of its kind for sale to Pike anglers in the U.K. The perfect answer to the space problem on a boat, it can be used for unhooking and retaining a pike. With a fish friendly inner lining. Open up - Unhook Pike. Close up - Retain Pike! 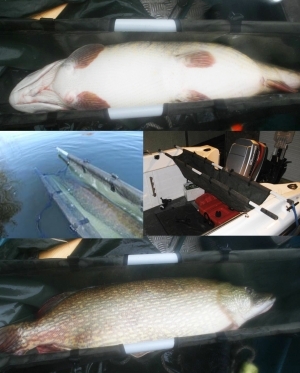 Weigh pike with it, release pike with it a versatile piece of kit! This product was first introduced at the PAC convention in September 2007 . Please note that the price in the shopping cart is for sale to UK only! For other countries please contact us on sales@eddieturner.co.uk before ordering and we will obtain a postage quote for you.